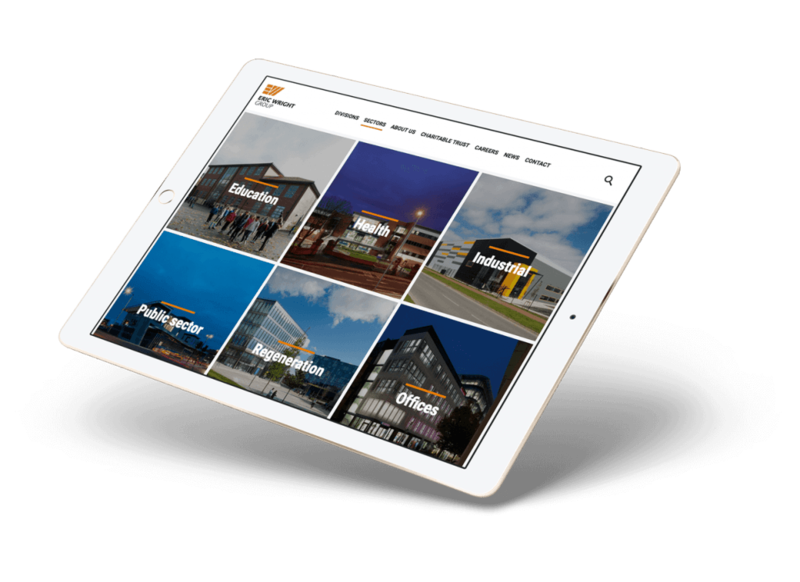 The Eric Wright Group is a leading force in the UK construction and civil engineering industry, with major public and private sector clients that include Network Rail, United Utilities and numerous Local Authorities in the North of England. Sometimes, information management is the bigger challenge of a great web build and The Eric Wright Group is certainly proof of that. With nine divisions and a charitable trust under one roof, the designers and copywriters at Soap had the challenge of creating an informative and goal driven information website that performs to highest standards. Extra attention was dedicated to understanding the expectations of various stakeholders (visitors with existing or potential relationships to the business) and to laying out an attractive, informative and engaging website that drives conversions and maintains The Eric Wright Group as an industry leader. One of the first priorities identified by Soap for this project, was to undertake stakeholder interviews and create visitor personas that helped us to understand the priorities of likely visitors to the website. This lets us create informed IA (Information Architecture). High bounce rates and drop offs are a sign that a website is failing to meet the visitors needs or the goals the website should achieve for the business. As the official online presence of a dominant brand, EricWright.co.uk is visited by many different types of users, from the delivery man in the van to local councils looking to tender a motorway engineering contract. First impressions matter, and while grammar and style are vital, so too is the way a brand communicates about itself. A brand’s tone of voice instils a sense of character, consistency and confidence that makes the content easier to engage with and more memorable. Large organisations with many subsidiaries tend to update web copy sporadically over time, which is when problems creep in. Our copywriters at Soap Media identified and corrected the weaknesses that emerged in the former Eric Wright content and produced a comprehensive guide for any future branded content.